What’s That You Said…Both an Evening and a Morning Comet?? Sun-hugging Comet McNaught (C/2006 P1) was a wonderful sight ten years ago this month for the few who saw it in the northern hemisphere during January 2007. It became visible to the unaided eye here in Wisconsin around January 4th, and brightened significantly during the next several days. This unexpectedly bright comet reached a close perihelion (0.17 AU) on Friday, January 12, 2007 and became a spectacular sight from the southern hemisphere, but at that point our turn was over. 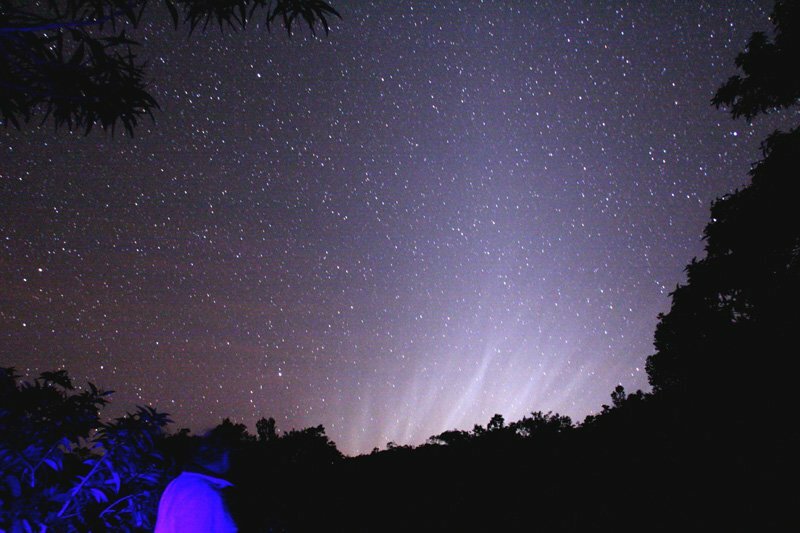 You may have heard (or witnessed) that Comet McNaught was visible in both the morning and evening twilight sky. In fact, from SW Wisconsin the comet was visible both morning and evening from December 18th through January 9th. How could that be? It seems to defy common sense! By looking at this video, you can see that Comet McNaught rose above and to the left of the Sun in the a.m. and set above and to the right of the Sun in the p.m. Because the Comet-Sun line was nearly perpendicular to the ecliptic, as the sky rotated (due to the Earth’s rotation) during the day, Comet McNaught stayed “above” the Sun all day long, as shown in this video. In the video, the blue/green line is the ecliptic, the plane of the Earth’s orbit. Let’s use a clock analogy. The Sun is at the center of the clock and Comet McNaught is at the end of the hour hand. 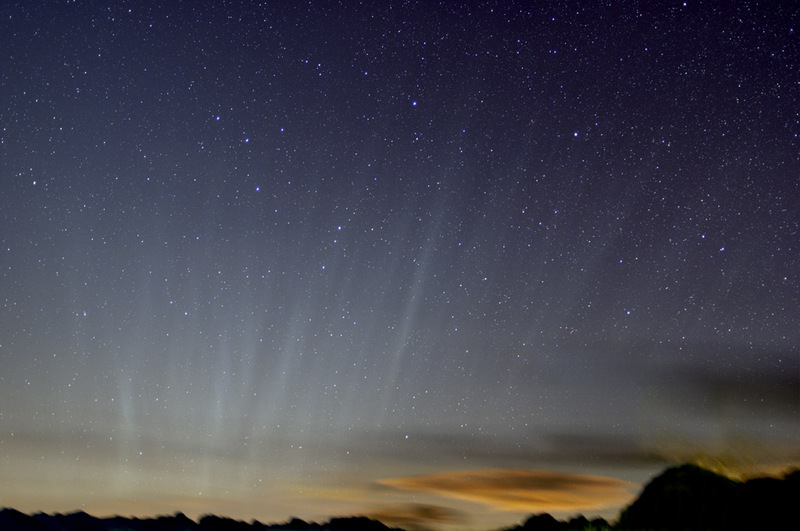 When Comet McNaught rises, it is at about the 10 o’clock position. As the Sun rises and crosses the sky from SE to SW, the comet hour hand “moves” from the 10 o’clock position to the 2 o’clock position at sunset. Though, of course, the clock itself is rotating clockwise, and the hour hand doesn’t move! I’m not satisfied with this incomplete explanation, but at least you can see what is going on. How good are you at visualizing spherical geometry in your head? 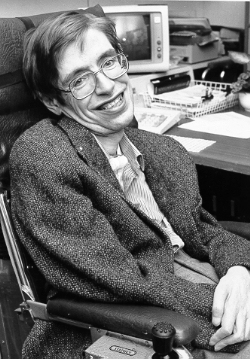 I’ll bet Stephen Hawking can do it. If you can come up with a better description of this phenomenon—which will occur for any celestial object in the right position as seen from a certain range of latitudes— please share in a comment here! Unusually bright and dusty comets sometimes exhibit spectacular dust tails, and Comet McNaught (C/2006 P1) did not disappoint. Thursday, Friday, and Saturday evenings, January 18th, 19th, and 20th, 2007, numerous observers in the Northern Hemisphere saw and photographed the poorly-understood synchronic bands above the SW horizon at the end of evening twilight, even though the head of the comet in Microscopium had set for those of us in Wisconsin between 3:00 and 4:00 p.m., long before sunset. From all accounts, it was an amazing sight to see the broad dust tail with striae (thin, parallel bands) extending up from the horizon with the comet’s head well below the horizon. I didn’t even think to look, and maybe none of you did either. Next time we’ll know!